At the invitation of Premier Li Keqiang, Prime Minister of the Republic of Trinidad and Tobago Keith Rowley will pay an official visit to China from May 14 to 19. During the visit, President Xi Jinping will meet with Prime Minister Keith Rowley. Premier Li Keqiang will hold the welcoming ceremony and welcoming banquet for him. The two prime ministers will hold talks and attend the signing ceremony of cooperation documents. Besides Beijing, Prime Minister Keith Rowley will also visit Shanghai and Guangdong. Since the establishment of diplomatic ties, the relations between China and Trinidad and Tobago have made remarkable headway. China values its relations with Trinidad and Tobago and we are willing to join hands with Trinidad and Tobago to enhance political mutual trust and expand friendly exchanges and practical cooperation in various areas for the benefit of the two countries and two peoples. We believe that the visit of Prime Minister Keith Rowley will further deepen our comprehensive cooperative partnership featuring mutual respect, equality, mutual benefit and common development. Q: There were reports that US cars, logs, fruits and other products are being held up during customs clearance for added inspections. Is this true? And if so, is this retaliation for US trade tariffs? A: I am not aware of the situation mentioned by you, and I would like to refer you to competent authorities. In principle, I want to point out that China always adopts the scientific and unbiased method to conduct inspection and quarantine of imports in accordance with laws and regulations. Q: According to reports, on May 9, the Chinese and Japanese governments reached an agreement on China providing a pair of crested ibises to Japan, and the two sides signed a memorandum. It has been 11 years since China offered crested ibises to Japan last time. What is your comment? A: Known as "the Diamond of the Orient" of its kind, crested ibises are deeply adored by both the Chinese and Japanese people and they have become a symbol of our friendship. China and Japan have joined hands to protect crested ibises since the 1980s. China has since then provided 5 crested ibises to Japan and helped it to restore its crested ibis colonies. Japan has supported China's efforts to preserve the crested ibis habitats through official and private programs. Thanks to long-term endeavors, the number of crested ibises in China has grown from 7 in 1981 to over 3000, and the wild crested ibis colonies have been recovered in Shaanxi, Zhejiang, Henan and other provinces through reintroduction and other measures. In Japan, the number of crested ibises has reached around 500 and the wild crested ibis colonies have also been restored through the reintroduction of artificially reared individuals. The China-Japan win-win cooperation for the preservation of crested ibis has become a successful exemplar in the history of world wildlife protection. Now, China's offering of two crested ibises for joint breeding study will not only help to increase the genetic diversity of Japanese crested ibis colonies but also further enhance the friendship between the two peoples. Q: On May 8, the Armenian parliament elected Nikol Pashinyan as the country's new Prime Minister. What is your comment? A: Armenia is a friendly cooperative partner of China. We respect the choice made by the Armenian people and stand ready to move forward our bilateral relations and advance cooperation across the board. 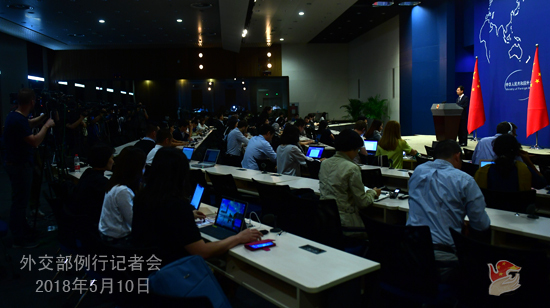 Q: We have noted that the Joint Statement on the 2018 Inter-Korean Summit was issued at the 7th China-Japan-ROK leaders' meeting which was held in Japan yesterday. Do you have more information? What are the other outcomes of this meeting? A: Indeed, this China-Japan-ROK leaders' meeting issued a statement on the Inter-Korean summit, and you may refer to that on the Internet. I would like to point out that against the backdrop of a series of positive changes taking place on the Korean Peninsula recently, it is conducive to the political settlement of the Peninsula issue that the leaders of the three countries exchanged views and uttered the common voice in this regard. In the meantime, I would like to remind you all that the leaders of the three countries not only discussed the Peninsula issue at the meeting, but also exchanged in-depth views on stepping up the trilateral cooperation and other issues of common interest. The meeting also issued a content-rich Joint Declaration. In the Joint Declaration, the leaders of China, Japan and the ROK sent out a forceful message to uphold the multilateral trading system, oppose protectionism and promote trade and investment liberalization and facilitation. The three countries agreed to accelerate the negotiations on the China-Japan-ROK Free Trade Area agreement and the Regional Comprehensive Economic Partnership. They also agreed to set up a "China-Japan-ROK plus X" cooperation mechanism to leverage their complementary strengths, explore the fourth-party markets, improve their international competitiveness, and spearhead and promote better and faster development of countries in this region. It has been two and a half years since the leaders of the three countries met last time. This meeting has rebuilt the momentum of China-Japan-ROK cooperation. It is of vital significance to deepening and expanding the trilateral cooperation, promoting regional peace and prosperity, and advancing the building of an open world economy. China has taken over the chairmanship of China-Japan-ROK cooperation after this leaders' meeting. Next year marks the 20th anniversary of the China-Japan-ROK cooperation. China looks forward to working with Japan and the ROK to follow through on the consensus and outcomes of this leaders' meeting and enhance mutual trust for closer cooperation. We will build the cooperation between the three countries into a flagship of East Asian cooperation, an anchor of regional stability and a driving force for global development, thus making new contributions to world peace, stability and prosperity. Q: According to reports, the incoming Malaysian government has said that it may seek to renegotiate some terms of the agreements with China. What is your comment? A: China and Malaysia are friendly neighbors. China values its friendly relations with Malaysia. Currently, the China-Malaysia comprehensive strategic partnership enjoys a sound momentum of growth with fruitful outcomes in mutually beneficial cooperation, which has delivered tangible benefits to the two countries and two peoples. This is worth cherishing and upholding by our two sides. We believe that Malaysia will maintain stability and development. We stand ready to work with the Malaysian side to follow the principle of mutual respect, equality and mutual benefit to move forward the China-Malaysia comprehensive strategic partnership, deliver greater benefits to the two peoples and promote regional stability and prosperity. Q: According to reports, Bulgarian mountaineer Boyan Petrov went missing when ascending to an altitude of more than 7,000 meters of the Himalayas. He is quite famous in Bulgaria. Do you have more details about this? What assistance has the Chinese side offered to the Bulgarian side regarding the search and rescue efforts? A: China attaches great importance to search for and rescue Bulgarian high-altitude alpinist Boyan Petrov. We have been making all-out efforts to do that after the accident. According to our information, the weather conditions are extremely bad for the search and rescue efforts which are still underway right now. 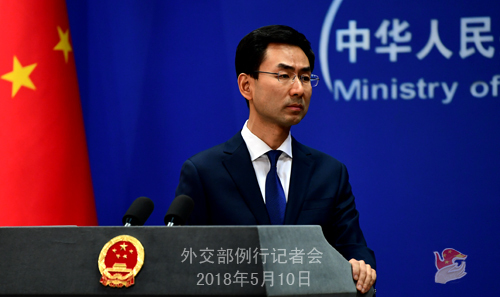 China will continue with its utmost efforts to search for and rescue him and facilitate and assist in the search and rescue efforts made by foreign professional teams. We will maintain close communication with the Bulgarian side in this regard. Q: Recently floods caused by torrential rains in Somalia have affected 400 thousand people, many of whom were displaced. Has the Chinese side offered assistance to the Somali side? A: China expressed condolences to the Somali side on the massive displacement caused by flooding. According to China International Cooperation Development Agency, the Chinese government has decided to offer emergency humanitarian assistance to the Somali government to help it fight floods. The Chinese government will closely follow the flood situation in Somalia and provide needed assistance and support to the Somali side as its capacity allows in light of the developments of the disaster and Somalia's requirements. Q: Malaysian opposition leader Mahathir Mohamad, who is going to form a new government, made some comments on China before. Will this affect China-Malaysia relations? A: As I said just now, China and Malaysia are friendly neighbors and China values its friendly relations with Malaysia. Now our bilateral relations enjoy a sound momentum of growth with fruitful outcomes in cooperation. This is worth cherishing and upholding by our two sides. Regarding the situation you mentioned, I want to say that Mr. Mahathir is a senior politician and he made important contributions to the development of China-Malaysia relations. Q: According to reports, recently, the South China Sea Tsunami Advisory Centre was inaugurated in the presence of Vladimir Ryabinin, Assistant Director-General of the United Nations Educational, Scientific and Cultural Organization (UNESCO) and Executive Secretary of the Intergovernmental Oceanographic Commission (IOC). What role is this centre going to play? How do you comment on that? A: According to our information, in order to strengthen the tsunami monitoring and advisory in the South China Sea region and with the authorization of the Intergovernmental Oceanographic Commission (IOC) of UNESCO, China has set up the South China Sea Tsunami Advisory Centre, which was put into trial operation at the end of January. The centre will provide 24-hour tsunami monitoring and advisory services to the neighboring countries of the South China Sea, including Vietnam, Malaysia, the Philippines, Brunei, Indonesia, Thailand, Cambodia, Singapore and China. It will also organize regional training and publicity activities. The Chinese people and the people of countries in this region have lived in the areas neighboring the South China Sea for generations and we enjoy long-standing friendship. China always stands for and stays committed to advancing maritime practical cooperation between littoral states of the South China Sea and fulfilling the cooperation obligations under the United Nations Convention on the Law of the Sea (UNCLOS). This serves the common interests of countries in this region and benefits people of all countries in the long run. 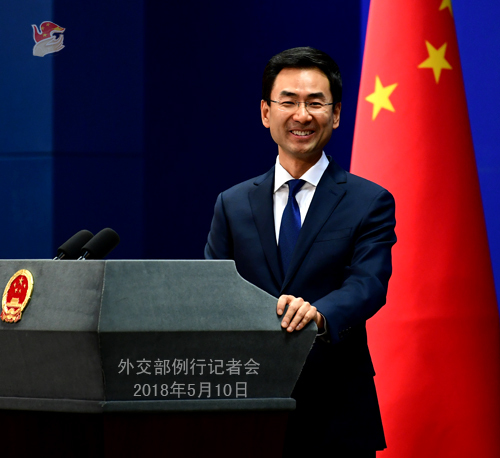 China stands ready to continue to provide public goods and services for countries in this region and work with them to uphold peace and stability in the South China Sea, advance maritime practical cooperation, and build the South China Sea into a sea of peace, friendship and cooperation. Q: The China Central Television (CCTV) this afternoon reported that the Chinese coast guards seized several ships involved in smuggling on the high seas near Shanghai, as oil was transferred from a ship to another. Some suspected that this is related to the DPRK. Has China stepped up its supervision on smuggling since relevant countries started regulating smuggling activities? A: You mentioned a report by the CCTV, but you aren't with it, are you? A: Could you please identify your media affiliation? I haven't seen this news and need to check on it. As to whether it has anything to do with the DPRK, in principle, China has always implemented all the DPRK-related resolutions adopted by the UN Security Council in a comprehensive, accurate, serious and strict manner. Our efforts to this end are there for all to see. Follow-up: Has China strengthened its supervision of DPRK-related smuggling activities? A: Our efforts to implement the relevant Security Council resolutions are there for all to see. Over the years, we have put in place a set of full-fledged mechanisms and practices to implement relevant Security Council resolutions.